The axle tubes are now made from 5/16" thick, high strength DOM tubing and engage 5/8" farther into the center section. On top of that, there is a 360° gusset welded around the tubes on the inside of the housing to ensure unparalleled strength. Trail-Gear introduces a new concept to the axle housing design. 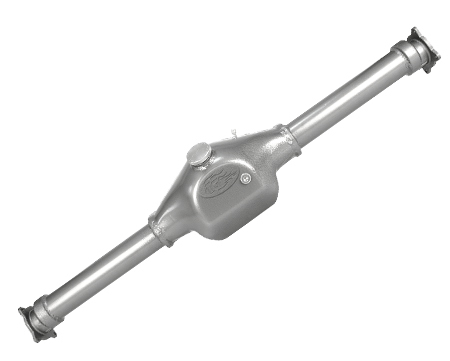 This exclusive design features axle tubes that have been offset above the housing centerline. The inner axles ride near the bottom of the axle tubes rather than in the center. The results are an increase of 3/8" ground clearance under the axle tubing. The heavy-duty, press formed, 1/4" plate steel center section shell is specially shaped to ensure a minimum of 3/4" additional clearance under the differential. The differential mounting surface is made from ½” plate steel to ensure studs can not pull out, even under heavy loads. The outer offset flanges are made from 4130 Chromoly to prevent distortion or bending. Housings are precision aligned using start-of-the-art, 3D digital imaging equipment. Overall housing length is 53 1/4" mounting flange to mounting flange. Empty housing is 54 lbs. Includes drain plug. Spring perches, shock mounts, and vent not included. Differential stud kit and RTV silicone are included and are recommended for use with this axle. Unpainted bare-metal, oiled finish to prevent rusting. We recommend that you degrease the housing inside and out before installation and painting. The original design concept for this axle was created by Jason (Locktup) Stanley. This rugged, high clearance design proved to be extremely tough and helped Team Trail-Gear win first place in the 2007 We-Rock F-Toy Series. Thanks Jason!